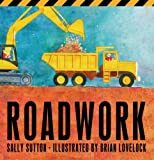 Every preschooler who is mad for machines will revel in this bright, boisterous picture book about the exciting process of building a road. There are many big machines and busy people involved in building a road, and this riveting picture book follows them every step of the way. From clearing a pathway (SCREEK!) to rolling the tar (SQUELCH!) to sweeping up at the end (SWISH! ), ROADWORK is sure to draw young onlookers with its rambunctious rhymes and noisy fun. This entry was written by saurabh, posted on November 2, 2010 at 6:10 pm, filed under Baby-3 and tagged Aviation, Basic Concepts, Boats & Ships, Candlewick, Cars & Trucks, Sally Sutton, Science, Nature & How It Works, Trains, Transportation. Bookmark the permalink. Follow any comments here with the RSS feed for this post. Both comments and trackbacks are currently closed.